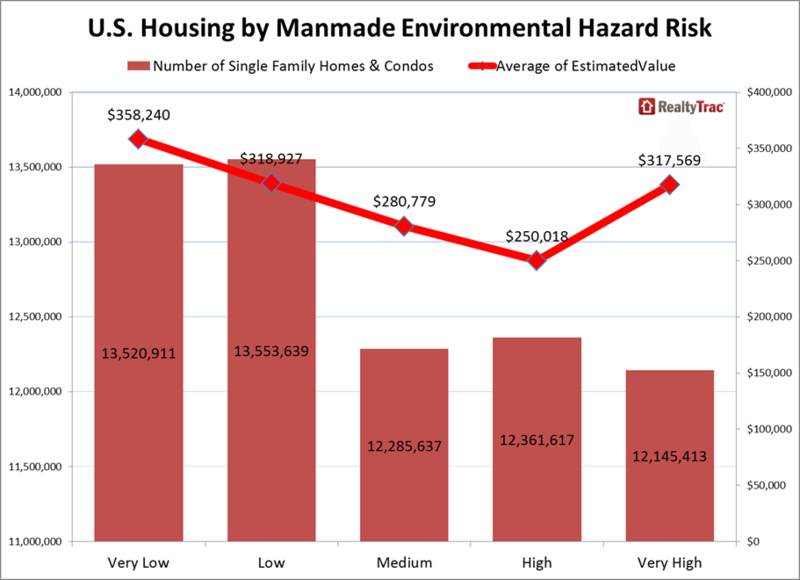 RealtyTrac released today its Second Annual Manmade Environmental Hazards Housing Risk Report, which analyzed 7,751 ZIP codes throughout the nation and measured five environmental hazards: air quality, superfund sites, brownfields, former drug labs and polluters. RealtyTrac broke down the risk into five categories, ranging from very high to very low. More than one-third of all U.S. single family homes and condos, or 25 million, are in ZIP codes at high risk or very high risk for manmade environmental hazards. In San Francisco County, zero ZIP codes are at high or very high risk. In the past 10 years, the median home sales price increased 45 percent. Nearby San Mateo County has one ZIP code, or 20 percent, Contra Costa County has one ZIP code, or 14 percent, and Alameda County has two ZIP codes, or 17 percent, in high or very high risk. “Buying a home in an area with low risk of manmade environmental hazards may not just be a good idea for health and safety reasons; it may also be good for financial reasons,” said Daren Blomquist, vice president at RealtyTrac, in a statement. The 12 major markets with no ZIP codes at high risk for manmade environmental hazards include Albuquerque, N.M.; Anchorage, Ala.; Cape Coral-Fort Myers, Fla.; Charleston, S.C.; Myrtle Beach, S.C.; Naples, Fla.; Palm Bay, Fla., Port St. Lucie, Fla.; Provo-Orem, Utah; Salinas, Calif.; Santa Rosa, Calif.; and Winston-Salem, N.C. The metro areas that saw the highest percentage of ZIP codes with a high risk include Riverside-San Bernardino, Calif.; Akron, Ohio; Cleveland; Stockton, Calif.; Louisville, Ky.; Reading, Pa.; Toledo, Ohio; El Paso, Texas; Los Angeles; Kansas City; Grand Rapids, Mich.; and Bakersfield, Calif.